The #1 Albums: Glen Campbell's "Wichita Lineman"
We reach the end of 1968 riding a wave of all-time rock classics, and we’ll see in 1969 with another, in next week’s installment. This week, however: As one of rock’s most legendary years turned the calendar into another, the biggest solo star in popular music was a nice young man from Delight, Arkansas, by the name of Glen Campbell. Campbell might have had a perfectly fine career if he had never stepped out of the role of session guitarist. He’s on records by artists spanning the spectrum from Frank Sinatra to the Monkees, and after a brief period touring with the Beach Boys in 1965, he was offered a permanent gig with them, which he turned down. He scored a record deal with Capitol shortly thereafter, and they put him to work—hard. In the space of about two-and-a-half years, Campbell would release 10 albums. Campbell’s breakthrough came in 1967 with the pop and country hits “Gentle on My Mind” and “By the Time I Get to Phoenix.” Each was the title song of a 1967 album, released in August and November respectively—and that’s after he’d released Burning Bridges in June. In 1968, Campbell released five albums. One was a duet album with Bobbie Gentry, and another was a Christmas album. And one was Wichita Lineman. The title song, written by Jimmy Webb, the hottest songwriter of the late 60s not named Lennon or McCartney, propelled the album to the top, but it’s just one of several strong songs on the record, alongside Tim Hardin’s “Reason to Believe” (later a hit for Rod Stewart), “The Dock of the Bay,” the Bee Gees’ “Words,” and Sonny Bono’s “You Better Sit Down Kids.” Wichita Lineman was #1 for a single week in December, but returned to the top spot for three weeks in March 1969 before dropping out again and coming back for one last week in early April. While Wichita Lineman sat at the top of both the album and singles charts in early 1969, Campbell got his own variety show on CBS-TV. The Glen Campbell Goodtime Hour had been a summer replacement for the Smothers Brothers in 1968, and it would run until 1972. Here’s Campbell singing “Wichita Lineman” on the show. 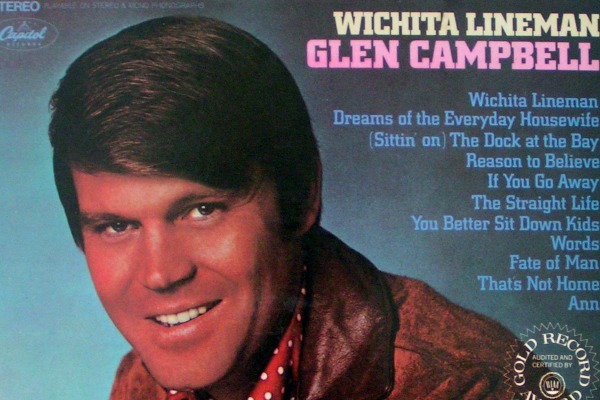 It’s pretty easy to understand why he became a popular TV star—and why “Wichita Lineman” is one of the best pop songs ever written.